The city of Leros after the air strikes between October 9 and 31, 1943. 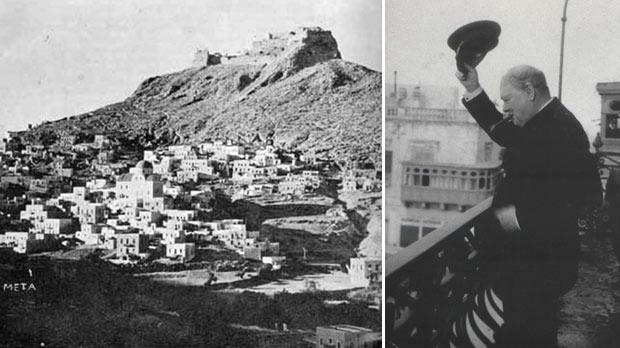 Right: Churchill on the Palace balcony waving his black naval cap to the public gathered in front of the Palace. 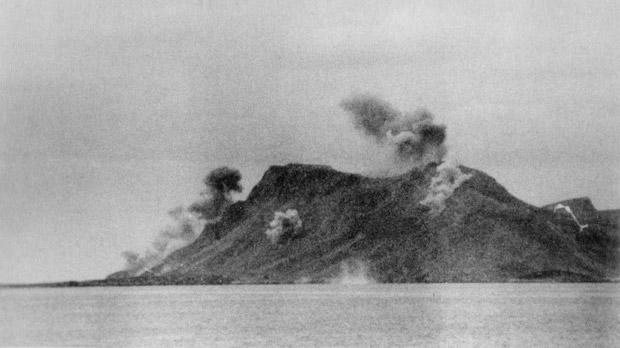 Mount Scumbarda on the island of Leros under aerial bombardment. British POWs en route to Lakki. Some of the POWs still have the Malta rubble wall camouflage on their steel helmets. 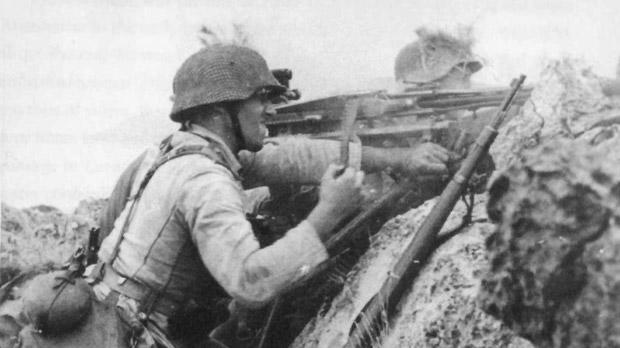 A German MG-42 team in action on the eastern slope of Appetici. 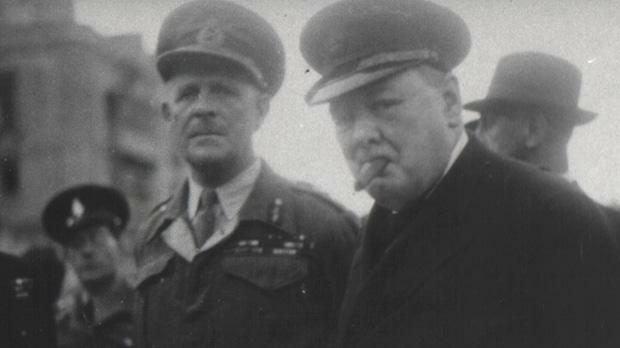 Churchill and Governor Lord Gort touring Valletta. British Prime Minister Winston Churchill giving the ‘V’ sign to dockyard workers while being shown around the dockyards by Rear-Admiral Kenneth MacKenzie, Vice-Admiral L.H.K. Hamilton and Field Marshal Lord Gort, on November 17, 1943. British prisoners-of-war being marched towards Santa Marina. 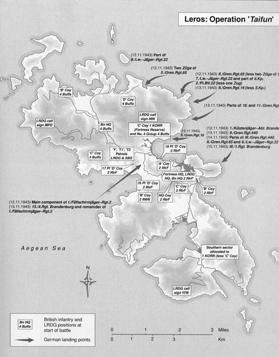 Map of Operation Taifun (Typhoon), the German landings on the island of Leros. 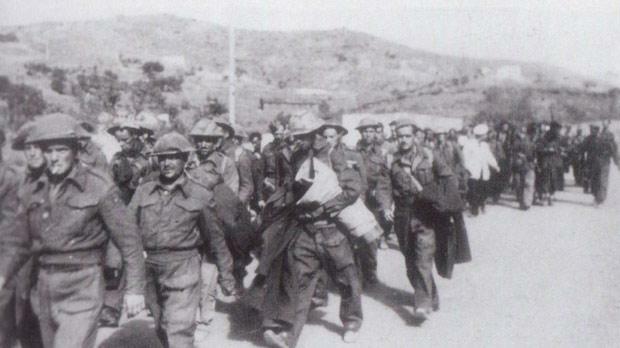 After the surrender of the Italian and British forces on the island of Kos in the Dodecanese, which included 680 men from the 1st Battalion, Durham Light Infantry, on October 4, 1943, 1,388 British and 3,145 Italians were taken prisoners. A German communiqué on October 5 reporting the cessation of hostilities on Kos gave the number of prisoners taken as 600 British and 2,500 Italians, with more Italians coming in. A number of the British force escaped to neighbouring islands and were rescued by the Special Boat Service operating at night. On November 5, 1943, the 8th King’s Own Royal Regiment (Lancaster) left Malta for Egypt. The garrison of Leros consisted of 4th Buffs (The Royal East Kent Regiment), 2nd Royal Irish Fusiliers and 1st King’s Own Royal Regiment (Lancaster), with some light anti-aircraft gunners and Indian engineers. The Italians were manning coast defence guns, reinforced by four 18-pounders. As nothing bigger could use the narrow roads, transport consisted of a few jeeps with trailers. Deep bays broke up the island into a shape not unlike a butterfly flying northeast with a varying span of some eight miles and a body two miles long. 4th Buffs held the northern wing with ‘C’ Company, 1st King’s Own Royal Regiment (Lancaster), under Major W. P. T. Tilly, located as ‘Fortress Reserve’ just north of Gurna Bay. 2nd Royal Irish Fusiliers with a company of Royal West Kent defended the centre portion, which included the neck of land between Gurna and Alinda bays and Leros town. 1st King’s Own was responsible for the southern area. 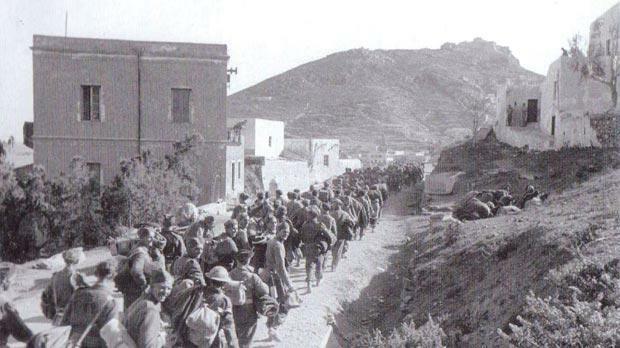 The whole Allied garrison of Leros consisted of most of the 234th Infantry Brigade, (re-formed on April 1, 1943, from the 4th (Malta) Infantry Brigade) circa 3,000 men of the 2nd Battalion, The Royal Irish Fusiliers, under Lieutenant-Colonel Maurice French, the 4th Battalion, The Buffs (The Royal East Kent Regiment), the 1st Battalion, The King’s Own Royal Regiment (Lancaster), and the 2nd company of the 2nd Battalion, Queen’s Own Royal West Kent Regiment, under Brigadier Robert Tilney, who assumed command on November 5. The Royal Navy in the Dodecanese was commanded by Vice-Admiral Algernon Willis, who was anxious to strengthen its forces in the field to facilitate supplies and hinder German maritime movements. To this end, he was assigned eight destroyers, a flotilla of submarines, six motor launches equipped with machine guns, four landing crafts installed with anti-aircraft guns and eight RAF high-speed launches. In support of these units were available men of the Long Range Desert Group (LRDG) and the Special Boat Service (SBS, composed entirely of paratroopers under the command of Major and Jellicoe), trained and formed by veterans of other battles. The actions of the Royal Navy were limited by the distance from bases in Cyprus and Alexandria in Egypt and the lack of air cover, but it nevertheless served to delay the invasion of the island, giving the defenders time to prepare them better to counter the attack. There were also about 8,500 regular Italian soldiers, mostly naval personnel, under Admiral Luigi Mascherpa. The German forces were active in the Aegean part of Army Group E under the leadership of the Generaloberst Alexander Lohr. The plan to occupy the island of Leros was initially called Operation Leopard and then Operation Typhoon, whose direction belonged to General of the Infantry Friedrich-Wilhelm Müller. The German general had at his disposal three regiments of the 22nd Infantry Division Airborne, a battalion of the 11th Field Division Luftwaffe and some elements of the 2nd Fallschirmjäger Division. Artillery units and departments of the Brandenburg Division were ready to be sent to the island after the first men had secured the beachhead. The Luftwaffe moved in front of the French and Soviet aircraft by assigning them different bases depending on the type: the bombers departed from Eleusis, Megara by fighter-bombers and Maritsa (at Rhodes), as the jets took off from Kalamaki (Zakynthos) and Argo. Leros had been subjected by the Luftwaffe to a prolonged aerial bombardment, starting on September 26, which had caused significant casualties and damage, both among the defenders of the island and the supporting naval forces. On the night of November 10 to 11, a group consisting of the destroyers HMS Petard, HMS Rockwood and ORP Krakowiak bombarded Kalymnos, and HMS Faulknor bombarded Kos, where German forces were assembling for the attack on Leros. The German invasion fleet, escorted by over 25 ships, mostly U-boat hunters, torpedo boats and mine sweepers was sighted on November 12, 1943, at 4.30am, after almost 50 days of air strikes, when the light was beginning to grow in the east. The Italian coastal guns were powerless to prevent the German troops from being put ashore in Palma Bay and near Pasta di Sopra on the northeast coast of the Buff ‘S’ sector, also in Tangeli Bay near Leros town. This last landing was staunchly resisted by the Royal Irish Fusiliers, but although they prevented the capture of the two features of Castle Hill and Mount Appetici, they were not strong enough to drive the enemy back into the sea. The positions of the British units were spread around the island with poor communication between them. The attacking German forces not only had the advantage of numerical superiority but also that of air control. In the early afternoon, Luftwaffe fighter-bombers machine-gunned and bombed the area between Gurna and Alinda bays, followed by Junkers 52s, which dropped some 500 parachutists from the Brandenburg Division, most of whom landed safely despite British efforts. The position of these landings effectively divided the island in two, separating the Buffs and a company of the King’s Own on the south side of the island from the rest of the garrison. Counterattacks during the rest of that day failed. During the night of November 12 to 13, more German reinforcements arrived. Counterattacks by the King’s Own and the Fusiliers on November 13 failed with heavy casualties, but the Buffs on the south side of the island managed to capture 130 prisoners and reclaim some control of their area. On the night of November 14, two more companies of the Royal West Kent Regiment and their commanding officer, Lt Col Ben Tarleton, from Samos, landed at Portolago Bay. The fighting on November 14 and 15 was mostly inconclusive, with more casualties on both sides, although a counterattack by two companies of the King’s Own succeeded in recapturing part of Apetiki. Lt Col French was killed in this attack. On the night of November 15, the fourth company from the West Kents was landed and 170 German prisoners were taken to Samos. The Germans, on the other hand, landed an estimated 1,000 troops and artillery during that night. On the morning of November 16, it became apparent to the British commander, Brigadier Tilney, that his situation was untenable and he surrendered; 3,200 British and 5,350 Italian soldiers went with him into captivity. The 4th Battalion, The Buffs, in their isolated position, were unaware of the surrender so did not attempt to escape; consequently nearly the whole unit was captured. As with the Buffs, only 90 men from the West Kents managed to escape from the island. The withdrawal of the American fighters had sealed the fate of Leros. With no air support and heavily attacked by enemy aircraft, the three battalions had fought for five days until they were exhausted and could fight no more. Everything was done to evacuate the garrisons of the other Aegean islands and to rescue survivors from Leros, and eventually an officer and 57 other ranks of the King’s Own rejoined the details in Palestine. After the fall of Leros, which was received with shock by the British public, Samos and the other smaller islands were evacuated. The Germans bombed Samos with Stukas, prompting the 2,500-strong Italian garrison to surrender on November 22. Along with the occupation of the smaller islands of Patmos, Fournoi and Ikaria on November 18, the Germans thus completed their re-conquest of the Dodecanese, which they were to continue to hold until the end of the war. The Battle of Leros was considered by some to be the last great defeat of the British Army in World War II and one of the last German victories. Meanwhile, as British Malta veteran troops were being overrun on Leros and the remaining Dodecanese islets, British Prime Minister Winston Churchill arrived in Malta on November 17, 1943. 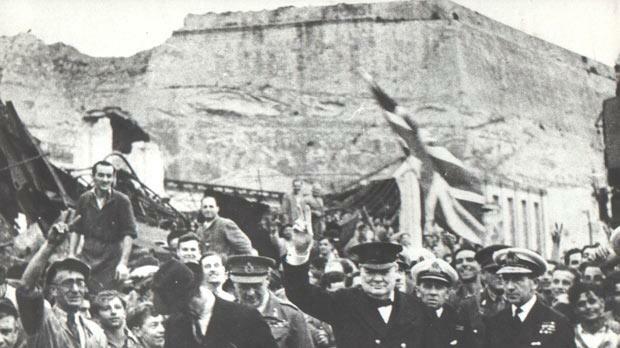 The British Prime Minister, who had long expressed his wish to visit Malta to see for himself the ravages of war, remained here until November 19. His visit was not given any publicity, nor was a programme of public appearances prepared. This was due to the fact that he was suffering from a feverish cold, which confined him to bed for most of the time. He did manage, however, to attend a staff conference and to visit the dockyard, where the workers gave him an enthusiastic welcome. Afterwards, Churchill and Lord Gort drove into Valletta where a sizeable crowd gathered on Palace Square. At the Palace, Churchill emerged on the balcony, waving his black naval cap and giving the ‘V’ sign; he made three appearances in response to the repeated cheers of the swelling crowd. During his visit, the British Prime Minister was accompanied by the Chiefs of Staff and by his two children, Major Randolph Churchill and Section Officer Sarah Oliver, WRAF. Relevant artefacts and information can be seen at Heritage Malta’s National War Museum in Valletta.